Linda Scott is taking a break after a morning spent at Holyrood being grilled by MSPs seeking her views on the Scottish economy and the enterprise network. She has travelled into Edinburgh from her base at the West Lothian Chamber of Commerce in Livingston and thinks she at least gave them plenty to think about. “I’m not sure how it went, I just hope I came across in the right way,” she says, reflecting on what she told the Economy, Jobs and Fair Work Committee. Scott sees herself as strong-willed and demanding and admires others who are “ballsy” and want to try new ways. She hopes the message got through to her inquisitors. 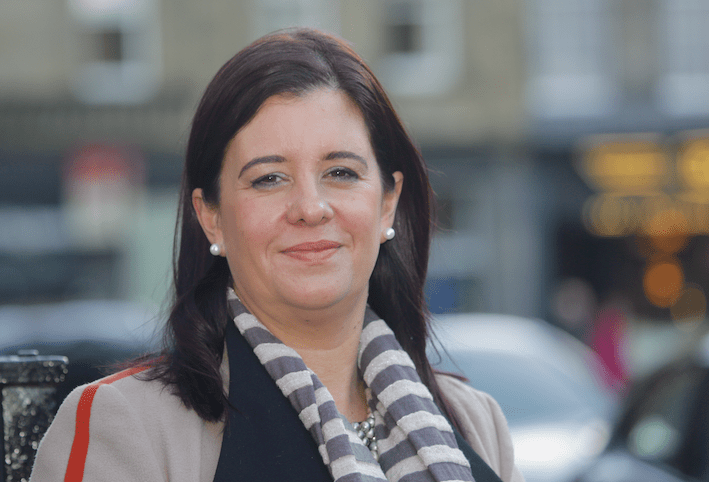 Scott has just marked five years as chief executive of the Chamber and says she is enjoying the opportunity to meet new people from different sectors, and help drive the business agenda. She recently hosted the organisation’s 17th Business Excellence awards ceremony, regarded as the flagship event of the year. It not only celebrates success, it brings together people who might never meet. “It opens a lot of people’s eyes to the successful businesses we have around us,” she says, adding that she wants the current part-time role to become a proper full-time post so that she can devote more of her energies to it. She also owns a recruitment business but has delegated day-to-day management because of the demands of the Chamber. She was an early starter in the business world, baking cakes at home in Invergordon for local cafes while still in her teens. That was only the beginning of a few energetic years during which she moved to Gloucestershire to work with top show horseman Robert Oliver, touring all the top shows in Britain, before coming home to provide personalised catering services to wealthy aristocrats and business people on private shooting and fishing estates around the Highlands. She cooked and effectively lived with those who were staying, either family or visitors, preparing breakfast, lunch, afternoon tea, and dinner. Among those she served was an Italian politician and his family who owned a big paint business, the Astors who lived on the edge of Balmoral, as well as the Whitbread family who have a home near Beauly. They accommodated her in a cottage in the grounds. She took her idea for a chain of internet cafes to the Princes Trust, but admits she was young and naive and got cold feet when they started talking numbers. “I’d spent a long time preparing a business plan and asked for £265,000. They came back with all these questions about margins, and so on, and I had no idea what they were talking about. “I just chickened out, but look what happened. The coffee business boomed! When the job on the estates began to get too exhausting she moved to Edinburgh, working again with horses, then getting a job with a food and wine school and later setting up a catering business, Gourmet Events, which became one of the country’s biggest operators in the weddings and parties sector. She sold the business but held on to the contract for Gosford House in East Lothian which she still holds and manages through her chef. Her experiences, she believes, have set up her up to understand the challenges faced by businesses and to offer guidance to her members. She hears a lot about wanting advice on sources of funding and skills. “Companies tell me they can’t get the right people, yet there are people out there who can’t get jobs. “I think there is a need for a change of mindset. There is too much focus on CVs which aren’t always a good guide to what people can do. She admits she has particular views on Scotland’s advice network and supports an expected government shake-up of Scottish Enterprise and possibly the Business Gateway network. She exudes enthusiasm for the business world but thinks there is too much focus on process and on the business plan rather than the operations plan. “You need a plan for action. What, who, where, when? Everyone needs to know what is expected of them. If you were to give any business advice what would it be? Not looking at the finances closely enough. Trying to do too many things at once. I went to a horse show and found myself standing next to the Queen. We chatted for 20 minutes about horses. She was very nice. If you were to hold a meeting with three people from the past or present who would you choose? Lady Thatcher, a bit of a Marmite choice, I suppose, but I have become fascinated by politics and I like strong women figureheads. She didn’t do everything right, but she had balls!